Drivers who are on the lookout for a reliable family vehicle have a lot of outstanding options to choose from, including models from the minivan segment as well as three-row SUVs. As far as minivans are concerned, the Kia Sedona and Dodge Grand Caravan are among the most popular vehicles for families. Minivan shoppers who would like to learn about key differences and similarities between the 2017 Kia Sedona and 2017 Dodge Caravan can utilize the information below to determine which model is best suited for them and their lifestyle. The Kia Sedona and Dodge Grand Caravan both come with comfortable seating space for seven passengers as well as plenty of cargo room, although the Sedona offers roughly 10 more cubic feet of cargo room than the Grand Caravan. The 2017 Sedona also has achieved a 5-star safety rating, compared to the 2017 Grand Caravan’s 4-star rating, and comes with standard features like a rear camera display, auto-off headlights, satellite radio, and Bluetooth compatibility. These features are only optional on the Dodge Grand Caravan base trim. Another element that sets the Kia Sedona apart is its 60-month, 60,000-mile bumper-to-bumper warranty, which offers peace-of-mind for drivers and their families. Which minivan is right for you? 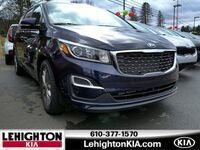 When you are ready to experience the 2017 Kia Sedona in Lehighton, PA, you can schedule a test drive with our team at Lehighton Kia.